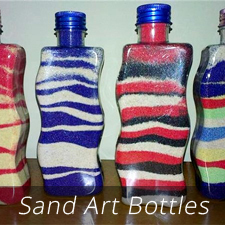 Sand Art Creations are Picture Cards or Bottles that get to be applied or filled with Coloured Sands. 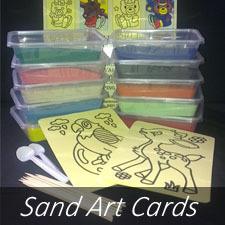 Sand Art Cards are also called Sandart Boards or Sandart Stickers. Watch Our YouTube Video to see how Sand Art Cards are created! Sand Art Cards are Arts & Crafts Activities for the young, or young at heart, and are great for all abilities, there are no mistakes in creating unique Designs and best of all it is…..
Fun Art, Innovative, Affordable and can be incorporated into Learning Activities/Projects in Educational Institutions. Sand Art Games, enriches the experience of PlaySand in a Safe Environment for kids, by adding Visual Stimulation, Fine Motor Skills, Eye & Hand co-ordination and the end result is a masterpiece of their own that gets to be taken home as a Great Keepsake or given as a Present. Are you organizing a School Fundraiser or a Birthday Party that you require the Children to create something that can be taken home? Sand Art Cards are a specially designed cut card that allows you to create amazing pictures by removing the cover paper, carefully, one section at a time and covering the exposed sticky sections with Coloured Sand. Note: Brightly Fluro Colored Sand is not suitable for Sand Art Cards. 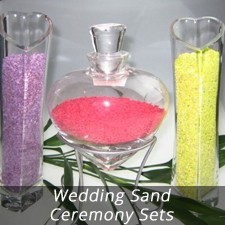 Colored Sand is provided when Sand Art Cards are purchased. Full instructions & tips will be supplied with every purchased Order. Sand Art for kids, is recommended from 5 years and up. Table decorations such as centerpieces with candles! DIY Party Packs for School Holidays! 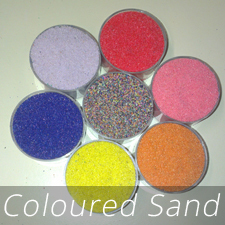 Visit our Gallery Page for some fun examples of our Sand Art..
Coloured Sand Stockist / Supplier in Melbourne! Sand Art Cards with Coloured Sands. Our Sand Art Cards will be the center of attention at your next Fundraiser! Children love creating art with coloured sands, whilst keeping them around your Event a little longer! We ship all over Australia, just send us an email through contact us page for a quote! *Arts & Crafts for Kids *Arts and Crafts Supplies Online Store-Australia *Kids Art & Craft *Creative Arts And Crafts Ideas for Children!